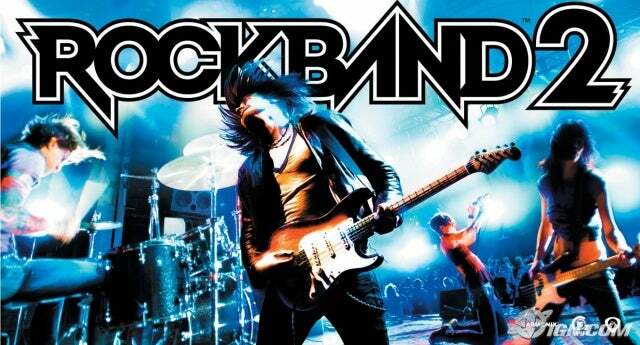 My Gadget, Game & Gizmo Obsession » Blog Archive » Are You Ready for Rock Band 2? Gamerscore at 10k, Blame Rock Band? Cyber Monday is on NOW! If you plan on shopping at Amazon.com this season, use our links. You'll get the same great prices, and will help support your favorite blog. Are You Ready for Rock Band 2? UPDATE: Don’t forget, you can get all your RB2 goodness at our hosted Rock Band Radio LIVE! station. This morning I took a few minutes to peruse my MP3 library and determine how many of the upcoming 84 tracks on Rock Band 2 (RB2) I already own. Well, I have 33 of them (including We Got The Beat). More than 1/3 of all the songs on the RB2 disc, not bad. Also, 9 of the RB2 songs are rare songs (i.e. bonus songs) that most people are likely to have never heard. Remove those rarities and I have 44% of the on-disc tracks. I’m pretty well decently prepared to get my drumming and singing on. Knowing me, I will probably purchase the MP3’s for all the songs (just because I like to have my music when I’m on the go). So, take a look at your CD’s, MP3’s, or cassette tapes (if you still roll that way). How many tracks from the Rock Band 2 disc do you already own? Will you be doing any MP3 buying in up-coming weeks, so you can have your RB2 library on the go? (List of RB2 tracks after the jump). “Feel the Pain” Dinosaur Jr. Thanks for confirming my lameness…I own exactly 0 mp3’s, tapes, CD’s, vinyl, 8-track, or ripped from the radio recordings of any of the songs….yet I’m still really excited about this game and setlist….where is my life going? LMAO! Man, you are too funny. (Right now, listening to So What’cha Want).